Marisol Flores is a girl with a curse. A bizarre and incredibly powerful monster has taken a liking to her, and is now obsessed with kidnapping her. Every so often it appears, takes over the Flores household, and holds her hostage in the attic. To be frank, it's all gotten a little old. Alejandra de Rosa is the girl with a cure. At the very least, she's a neophyte witch who has the power and knowledge to fend off weird beasts and save pretty damsels. 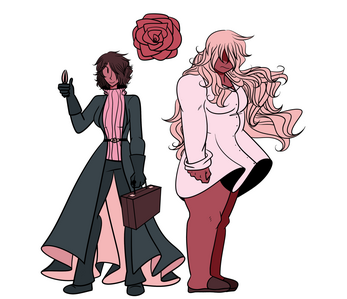 She's served as assistant for years to her grandmother, a powerful witch who has walked these halls many times before, driving the monster back and saving Marisol. This time, however, Alex will be doing this on her own. It's a routine job... so why do things feel a little more dire than usual today? US LOVELY CORPSES is a short surreal-horror-romance visual novel about helping a friend. Go through the house, cut the roses, and save the girl. Just remember: the monster knows you're here. There will be puzzles that you can only solve with hints from the roses, so try to keep an open ear while doing your job. But keep in mind you may not want to hear everything these flowers have to say. 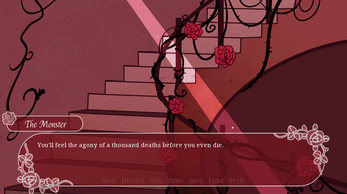 US LOVELY CORPSES contains sensitive, mature, and occasionally upsetting content. This game is not recommended for players under 16 or those of a nervous disposition. More detailed information can be found here. US LOVELY CORPSES has one bad ending, another bad ending, one very bad "ending", and one True End. US LOVELY CORPSES takes place in the same universe as HER FIRE. 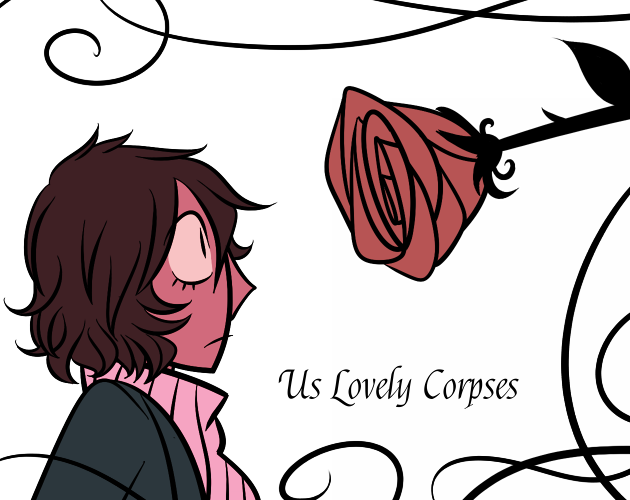 Edit - 3/7/2019: "US LOVELY CORPSES - ONE YEAR LATER" is now available to download. 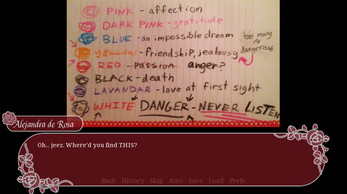 This is intended to be a sequel and will contain spoilers for the original visual novel! The novella is lovely, too! This was so tragically beautiful. I thought this was just going to be another horror click and play, same-old same-old, but this not only consumed my time, it consumed my heart. My family has a long line of depression and BP2. Finding another way to look at things really makes it so much better. Heartbreaking and yet healing. I love it. I downloaded the one for Mac, but it won't open?? I loved this game so much ... I related heavily to the characters and the art style was absolutely beautiful. Beautiful and heartbreaking. As someone with severe depression, this hit home pretty hard. But not in a bad way, at least not at the end. That true ending was uplifting in it's own, semi-fatalistic way. All in all, this was a fantastic, inclusive game and I really, really hope you make more! i think i got the true ending on my first try! yeeet! i'm glad you liked it! and i definitely encourage fanwork! 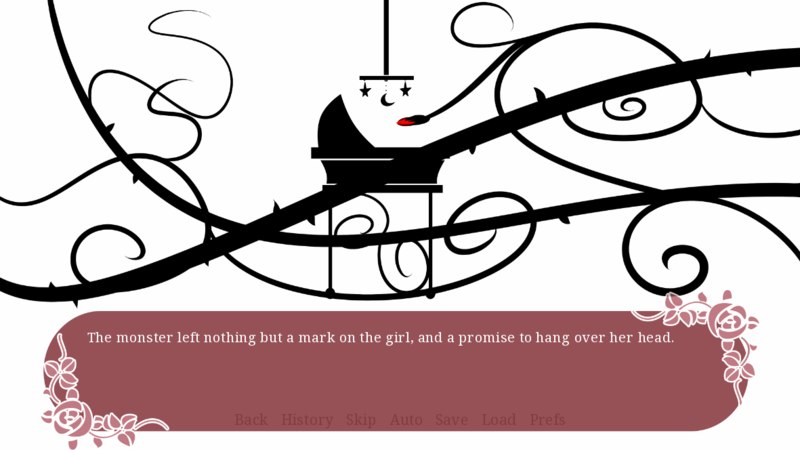 I think I got the true ending - but I am not really sure that it is. I expected the path I went with disturbing but it comes off as sentimental. But good game anyway. I manage to get what is probably the true ending on my first try, and given some of the talk in the warnings, I am a bit scared to try again even though I usually love 'the fourth wall will not protect you' type stories, and I somehow managed to avoid all that sort of stuff. If this game is any indication though, I love this world. I've been trying to formulate a comprehensive and thoughtful review for this game but: it gave me a few chills and the true end made me want to cry. This is just a really well made game, and effective for its length. The way the themes and the characters' stories unfolded with the gameplay was great and hard hitting. The monster was devastating, and very creatively represented. It's excellent horror that's like, a raw ache, haunting in how honest and real it is. And still your humor and charm shine through here. Glad I finally got around to play this, it's another great work. Adorable game.Loved the ending. I felt so bad for Marisol,it's difficult to feel different than other people. 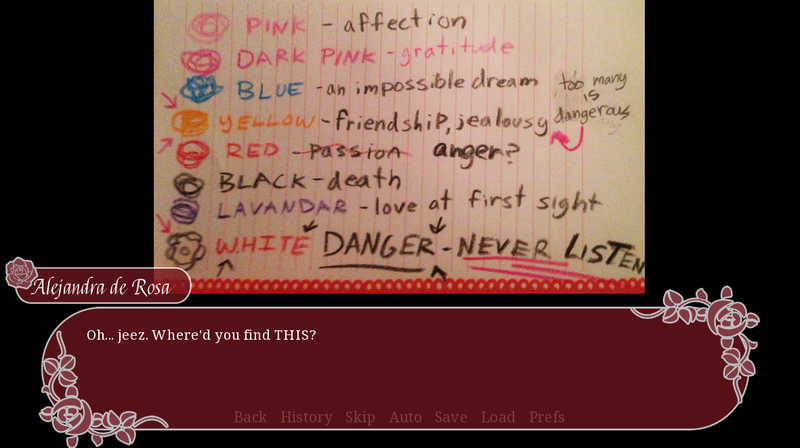 Heh, this made me feel happy but i relate a lot to Marisol, I think I got the 'good' end which was kinda wholesome. This was an incredible experience. Everything is presented with wonderful atmosphere, and the core concept of it is unique and strong and utterly uncompromising. The way you wrote these characters, and their situation...It wound up very relatable and, relevant. I've been really enriched by being able to experience a story like this, in this way. Thankyou so much for creating and continuing to create such wonderful, fierce art!!!! oh wow, thank you so much for this! i'm glad the game resonated so strongly with you! I totally adored this, thanks so much for making it!! I don't know what to say. This game is sweet, and mysterious, and just scary enough to occasionally send a shiver up my spine without frightening me away. The art is lovely, all pinks and blacks except for the roses. And I love the way it starts out as an everyday spooky flower-monster story, but gradually turns into a (much more harrowing) struggle of friendships strained by illness. Alex and Marisol are great. You totally deserve each other, you two brilliant disasters. thank you so much for the lovely comment! i can't tell you how much responses like this mean to me! i'm glad you liked my girls so much! thanks again! No offense to You-know-what, as it is my sweet child and contains my new waifu but seriously i adore this type of horror. it didn't just leave me with a slight quake and general anger because jesus no matter what you tell me that screne was a jumpscare this is like genuinely, actual middle-of-the-night-wakeup-nightmare scary. and i ADORE it. your artstyle is amazing btw. its so original and not in the everyoneone is special tumblr way, the really cool type. i like horror that knows you're scared. that note two is like why would you do that stop. like just aghhghghg i love this game so muuchhh! i'm too much of a traumatized wreck to go for the bad endings but i bet they are great too lol. im bad at saying things without explaining how they are better than other things, but i love this game, horror that isn't trying to be anything else, and that thing at the good end so SWEET my HEART????? oh wow, i can't tell you how much this comment means to me. ulc became a really personal project to me, and i really hoped it would touch some people. im glad you enjoyed the game so much! thank you so much for the kind words! Great atmosphere, great characters, great dialogues, great story. I really loved what the roses had to say and the way they said it. I'll try get all the bad endings (I only got one with the one i think it's the true ending) because I'm sure even those are interesting! Special mention for the art style: it's what caught my attention and it is just so unique and pretty! This is one of those games that, once you are finished, you are happy you played it because it changes you a little for the better. It's one of those stories that reach you when you need it and it never leaves you. I'll keep Alejandra and Marisol in my heart for a very long time. ahhh, i'm so glad it stuck with you so much! thank you so much for the lovely comment, i love feedback like this! if I could, I would give you a cake for this game. oh wow!!! well first off, thanks so much for the nice feedback! 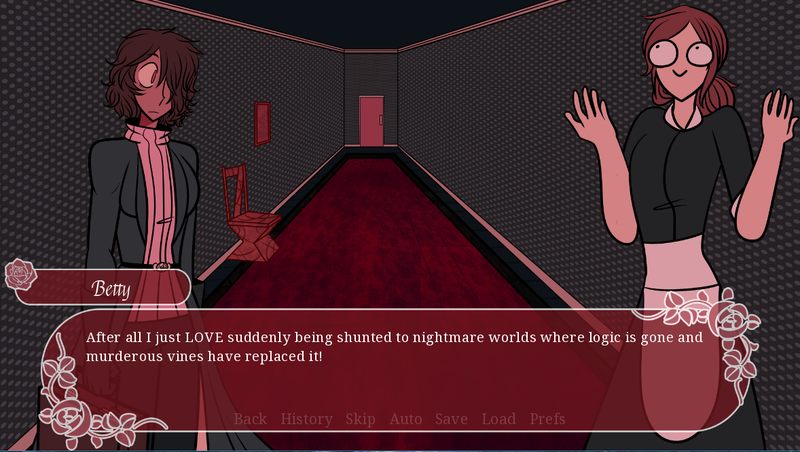 yeah, "horror" is probably a bit of a strong description, especially with a certain very popular horror themed visual novel still in the public eye, but i think it applies to this game due to the atmosphere and my inspirations for it. i think out of the bad ends, there is one that might typically be more of a "horror" ending. this comment seriously made my day! thanks so much! also, forgot to say, i have https://twitter.com/baiyu_dev to thank for the game's great UI! !